The Clever Choice® Autocode Voice talking glucose meter speaks the results in a natural, easy to understand voice. It also beeps to let know when sufficient blood has been absorbed for testing, removing any uncertainty. The new Autocode functionality automatically codes each new vial of strips to the meter, so that the user never has to worry about coding new vials. Unit can be set to speak in either English or Spanish. The Clever Choice Autocode Voice also has many other very attractive features. It uses only 0.7 microliters of blood for each test, far less than most meters. Results are available in 7 seconds. The Clever Choice Autocode Voice stores 450 results and keeps 7, 14, 21, 28, 60, and 90 day averages. Results are downloadable to your computer for storage and review. 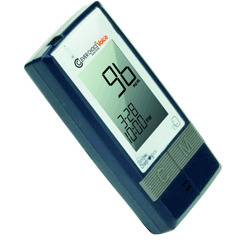 The Clever Choice Autocode Voice glucose meter can only be used with Clever Choice Autocode Voice test strips.